Going the extra mile required a little innovation as this custom case sealer for washing machines was transported by crane from the railcar to the customer's packaging floor. The sealer's oversized frame made it too large to move through the doors of the Maytag production plant. Loading up a truck with a case sealer, A-B-C originated the traveling packaging show. 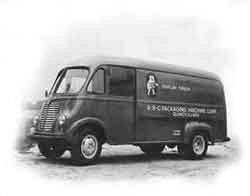 The van traveled across the nation, bringing A-B-C's new technology to the plant door. 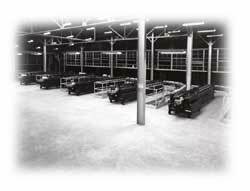 A-B C packaging machines were valued for their reliability in glass plants, where they operated 24 hours a day. 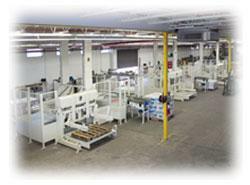 These semi-automatic case erector / sealers fed the glass packaging lines on the production floor below. The Tarpon Springs plant was acquired in 1955. Today the headquarters of A-B-C occupies this location, with a new, larger building that includes engineering, sales and production. Today, A-B-C machines travel from the production floor to customers' plants in many different industries around the world. 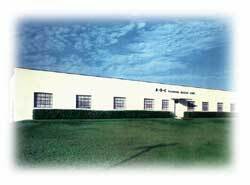 In 1940, in the town of Quincy, Illinois, Morris P. Neal founded A-B-C Packaging Machine Corporation. An engineer by trade, Mr. Neal designed the original box makers and sealers that automated the packaging line. 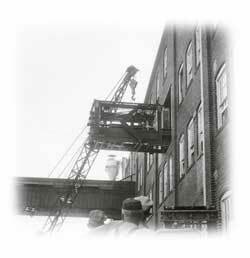 A-B-C equipment became known for its simplicity and reliability and the company's success grew. Soon, the product line was expanded to include bottle and can handling equipment and reshipper bottle decasers. On October 12, 1951, A-B-C became a member of the Packaging Machinery Manufacturers Institute (PMMI) and A-B-C management joined other packaging pioneers at a PMMI meeting at the Mid Pines Club in Southern Pines, North Carolina. In the early 1970's, James L. Neal, Morris's son, became president, and the company continued to grow. The late 1970's saw another packaging revolution, with the introduction of the polyethylene terephthalate (PET) beverage bottle. A-B-C developed innovative PET bottle packaging lines that linked case erectors, H-partition inserters and pad inserters to help blowmolders keep up with the burgeoning demand. By 1981, virtually every blowmolder in the country was operating packaging lines built by A-B-C. A pioneer in adapting successful machinery innovation for American markets, A-B-C signed an agreement with Max Kettner GmbH in 1977, and was among the first U.S. companies to customize European bottle handling machinery designs for the U.S. packaging industry. As the packaging industry consolidated in the 1980's and 1990's, A-B-C remained fiercely independent, led by president Donald G. Reichert. The company's sales network stretched into the Caribbean, Mexico, South America, Australia and the Far East. The product line expanded to include case palletizers, partition inserters, tab slitters and bulk depalletizers. Today, A-B-C's Tarpon Springs facility encompasses 100,000 square feet, with approximately 10,000 square feet devoted to the general offices, sales, and engineering and the remainder utilized for manufacturing, assembly and parts inventory. A-B-C machines operate around the world in many industries including food, beverage, household chemicals, computer electronics, cosmetics and glass and plastic bottle manufacturing. As the company embarks on the challenges of the 21st century, led by current president Mark Reichert, it is with a continued focus on quality, innovation and service. Over 76 years in business has shown that a firm commitment to serving customers will ensure mutual success in the future.